New Library PC Reservation System! At Durham Tech, our students and their academic work are our highest priority. We are excited to introduce you to our new PC Reservation system in the Main Campus library, which is designed to ensure that currently enrolled students will be able to access the upstairs library computers in a more timely manner. Current Durham Tech curriculum student, staff, or faculty member? To access our library computers, just log in with your Web Advisor username (last name, first initial, last four digits of your Durham Tech ID number). You may log in up to 5 different times for a computer session. You are allowed180 minutes for each session at all Web Advisor computers except the Express Computer, which limits all sessions to 15 minutes each. Current Durham Tech student without a Web Advisor account? You will need a Guest Pass from the desk to log in, but you may have multiple (up to 5) sessions daily. We will need to see your Durham Tech student ID and we will issue you a library card. Then when you come in, just show us your library card and we will ask you to sign in and then we will issue you your guest pass. Guest (includes public patrons and students not currently enrolled)? Guests may use one of four designated GUEST computers for one session of up to one hour per day, no extensions. Guests will need a Durham Tech library card in order to receive a guest pass. Each time you come in, we will ask for your library card and have you sign in, then we will issue your guest pass to use a computer. How can I get a public patron library card for a Guest Pass? Patrons must be at least 16 to be issued library cards and use computers. To be issued a public patron library card, guests who are 18 years of age or older should present proof of identification and North Carolina residence at the circulation desk. High school students (not including Durham Tech Middle College students, who have a Web Advisor username) from Orange and Durham Counties need a completed Parental Authorization form as well as identification in order to be issued a library card. Can I log in on more than one computer? No. You must use your own Web Advisor username and you are limited to one computer at the time. Can I make reservations in advance? Yes! Current Durham Tech students, staff, or faculty may set up their own reservations daily. Can my child use a computer while I do my work? No. Children under 16 may not use library computers even under parental supervision. Children are not allowed to be left alone in the library– we want children to be safe! If space is available, children may sit beside parents working on computers upstairs. Children are not allowed in the downstairs computer lab, which is for the use of currently enrolled students only. Please note that all computers will time out and log off your session after 15 minutes of inactivity, so be sure to save your work and monitor any time away. The PC reservation system is also installed in the computer lab downstairs, and students will need to log in using their Web Advisor username there as well. Remember that the lab is only for currently enrolled students; you’ll need to show your Durham Tech student ID with a current sticker and sign in. This system is new to us as well as to you, so we appreciate your patience as we work out the kinks. Please ask us if you need help or if you have questions! 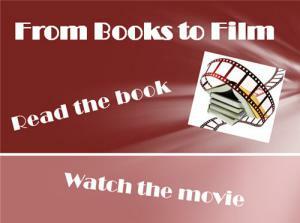 Books often translate well to film. Here are some of the titles that the library has as both book and DVD. Visit our display on the lower level for these titles.